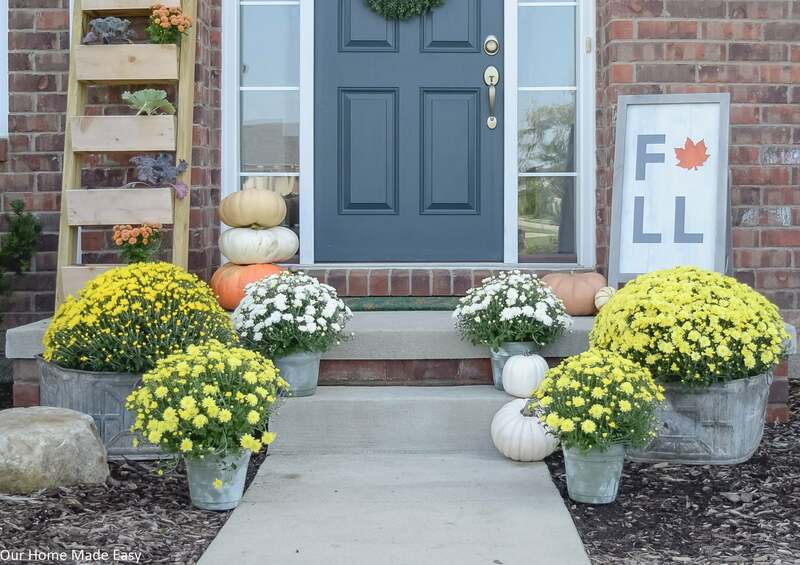 This simple fall front porch allows colorful mums to shine! 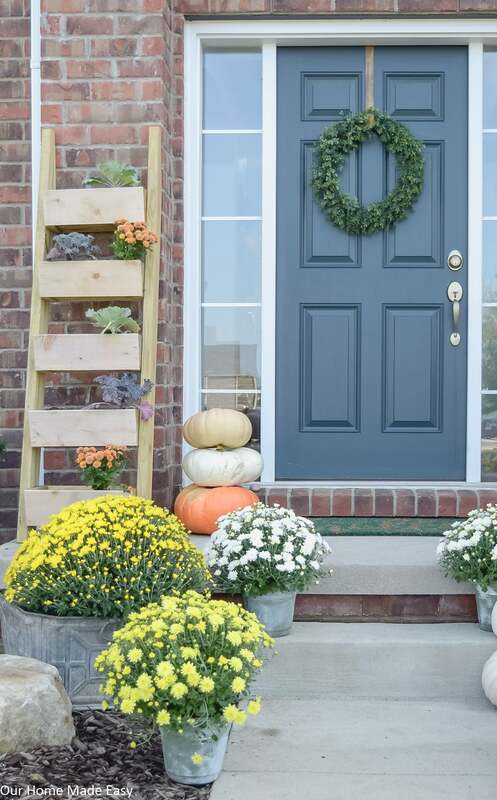 Add in a few DIY projects and you have a front porch that is pretty and still in the budget. Welcome back to our home! If you haven’t caught up with us lately, you can see this year’s entry way looking a little fancier than usual for fall. 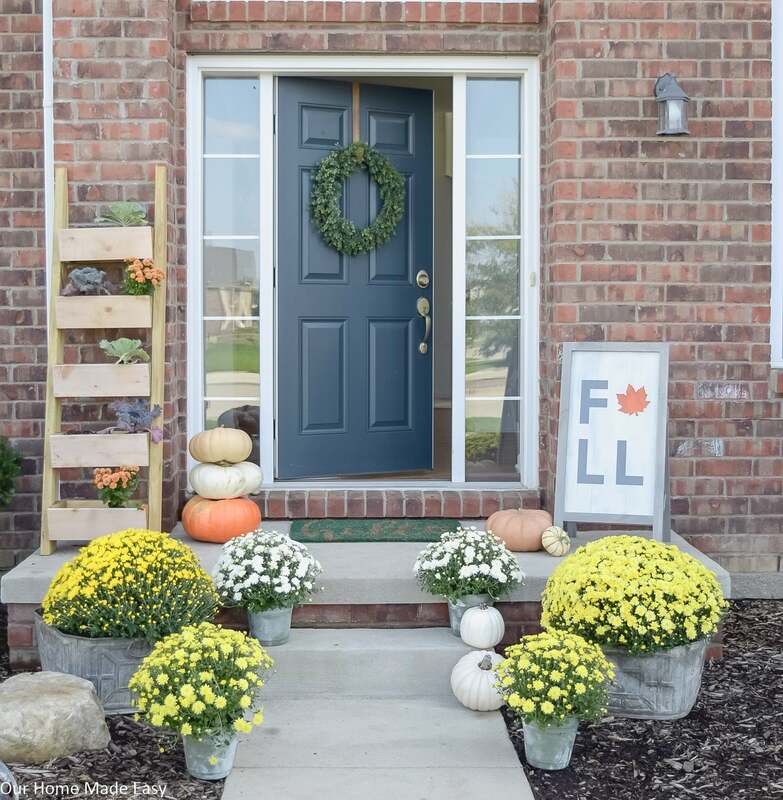 Today I wanted to share our simple fall front porch with you. 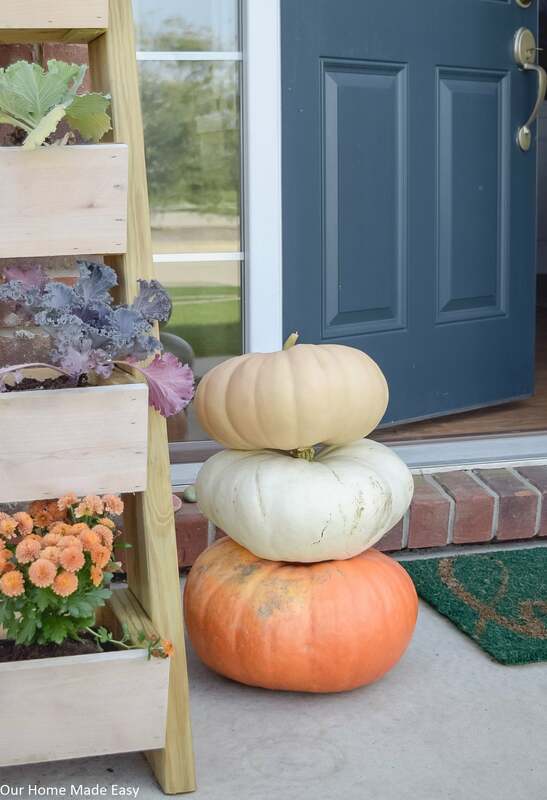 Over the past few year’s I’ve naturally created a rustic fall front porch theme and this year I wanted to try something different. Don’t worry, it’s nothing too outrageously different– in fact, I’m using alot of the same items as seasons past. But instead of a weathered wood sign and antique milk crates, I’m letting the plants do all the talking. And the best part? Seasonal flowers are some of the cheapest ways to add decor without spending much money. Everyone wins! This porch is basically a huge mess of mums from that I kept picking up while running errands. New shiny object pretty mum! Michigan has so many spots for us to stop along side the road and pick up a few pumpkins (or 5!). Not only are we able to support the local community, we receive some really cool pumpkins, too. How to decorate with just a few plants. Choose hearty plants. I love the cabbages because they don’t require much maintenance from me. 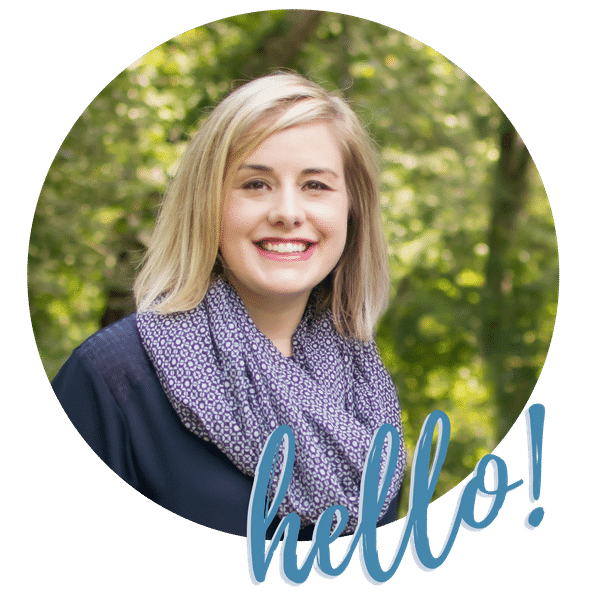 It’s hard enough for me to manage dinnertime, bath time, and bedtime routines. Adding something that’s really high-maintenance is a no-go for me. Use any planters you already have on-hand and pop in some hearty plants. Don’t worry about replanting them into the pot. I shamelessly leave them in the store container and use the planter as a holder! If you have a planter, like our $20 DIY Cedar Planter, you can buy small cabbages and mums for less than a couple of dollars each. I replanted them in less than 10 minutes. I can’t wait to see them grow over the next 2 months! Related: Those are my $3 planters! For summer, I chose to keep our entire front porch with flowers of a single color. For Fall, I still wanted to go easy on the variety of colors. Yellow to white and then to orange. 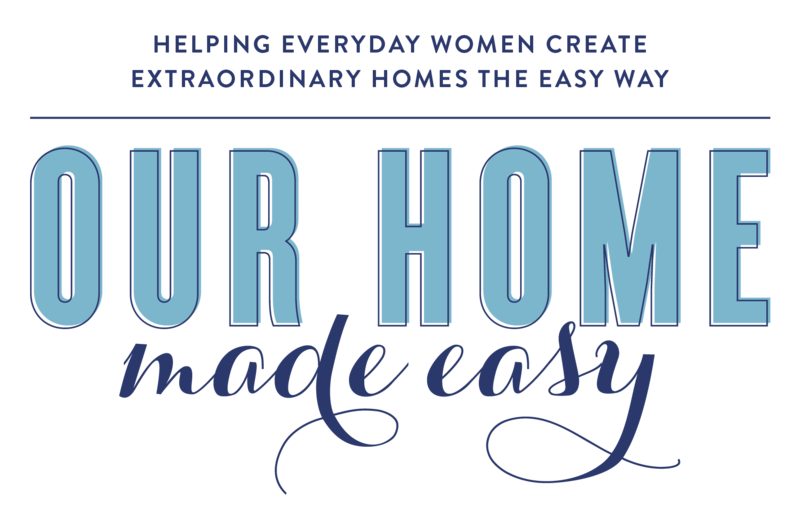 I think if you aren’t a decorating natural (join the club, we’re fun! ), stick to about 3 colors to keep the variety but without feeling like your eyes are overwhelmed. 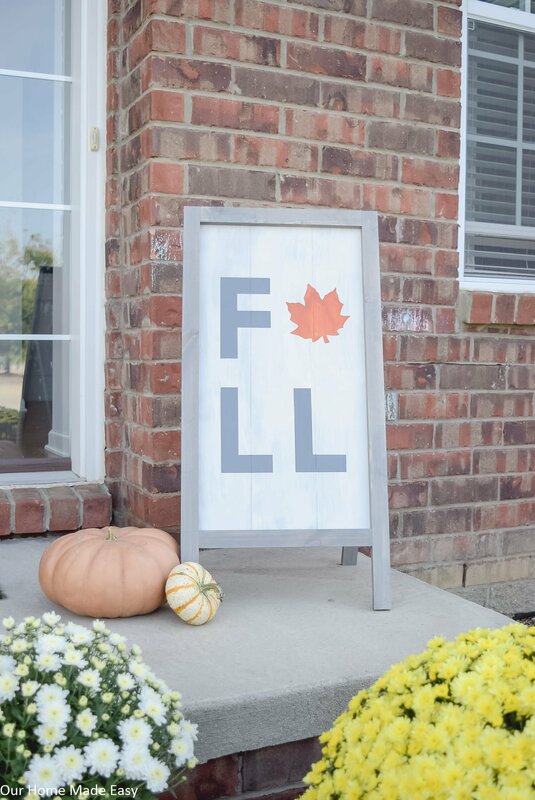 Pinterest is FULL of fun fall DIY projects. 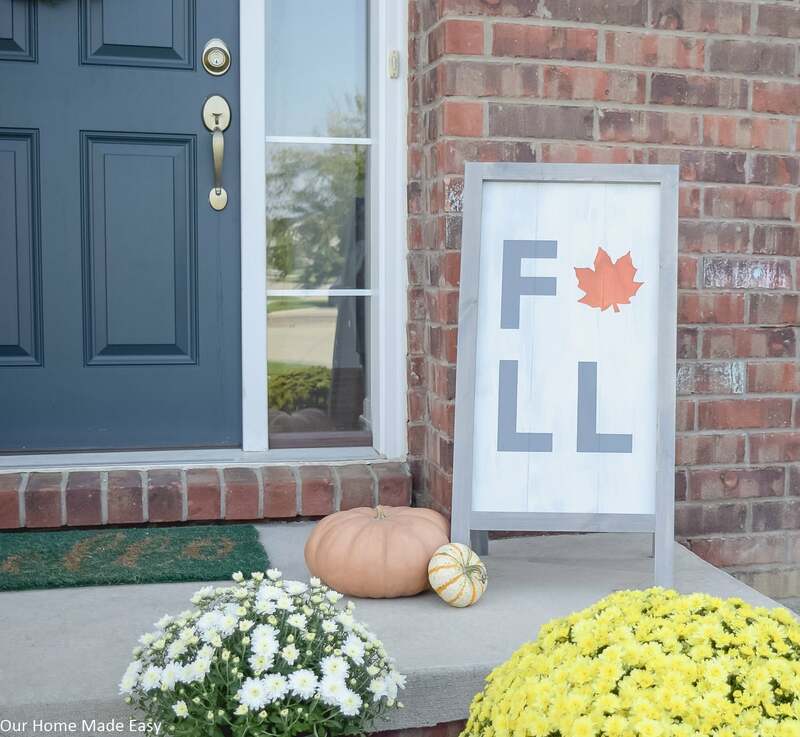 In the past I’ve created a DIY fall sign, used a ladder as planter, and this year Jordan built me that beautiful ‘FALL’ sign. Don’t worry, DIY tutorial will be coming next week! We made it for a fraction of the cost in the store and I am in love. Almost so much that I don’t want to keep it outside in the Michigan rain! Thank you so much for stopping by today! 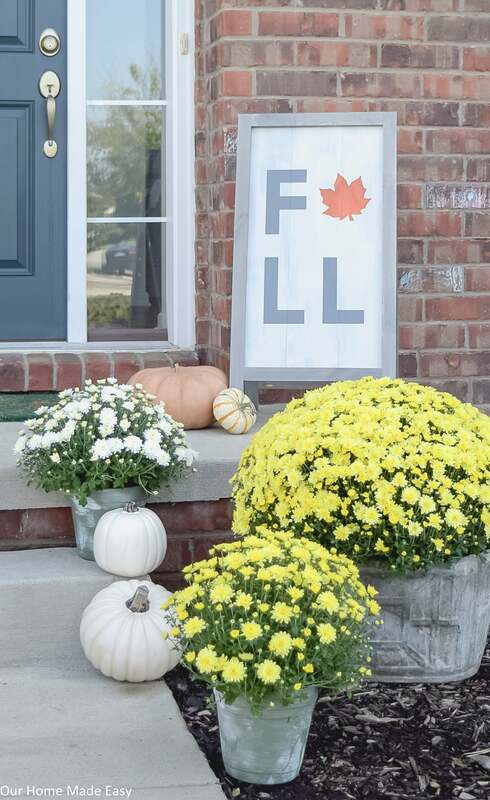 If you haven’t already, I encourage you to pick up your free front porch decorating guide. 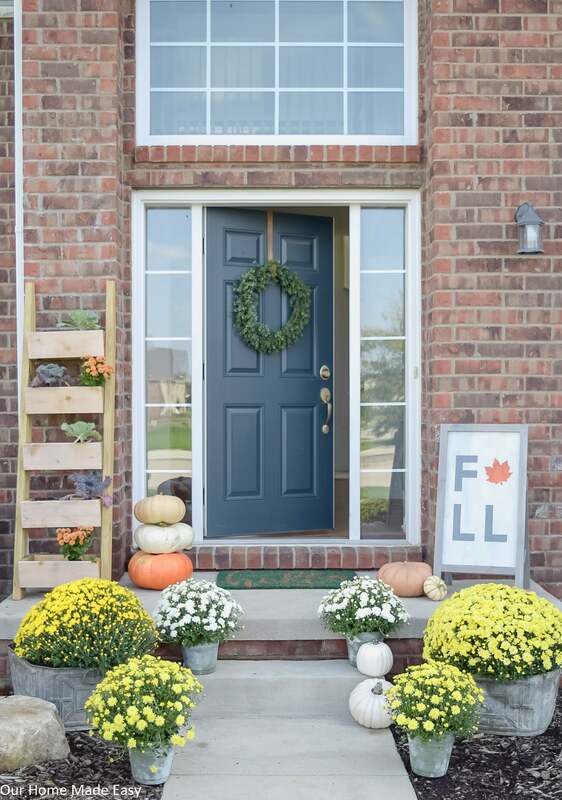 It will give you some inspiration to make your front porch perfect for you! 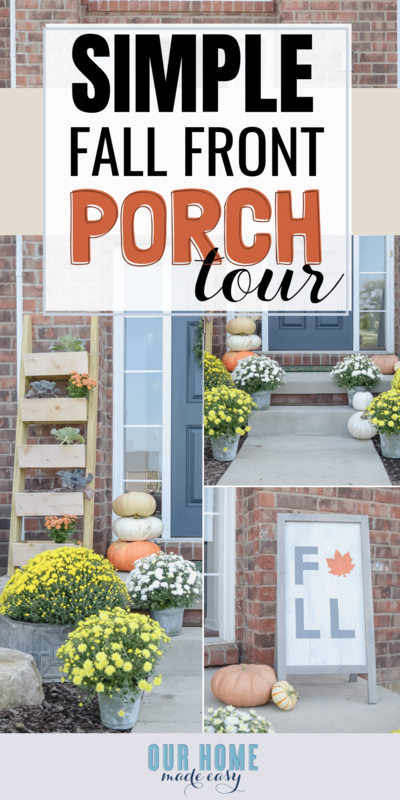 Get Your FREE Front Porch Decorating Guide Here!